EA today announced a release date for DICE's Battlefield: Bad Company 2, set to be March 5th next year. More great news were revealed, the awesome BF1943 has sold over 1 million copies. Guildford, UK – August 18, 2009 – Get ready to storm the battlefield! 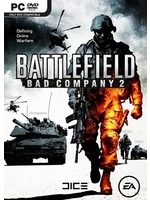 DICE, an Electronic Arts Inc. studio (NASDAQ: ERTS), today announced that Battlefield: Bad Company™ 2 will be available March 2, 2010 in North America and March 5, 2010 in Europe. Battlefield: Bad Company 2 will deliver a level of destruction, vehicular warfare, squad play and open world environments never before experienced in a modern warfare action game. By pushing destruction to new heights and delivering a host of land, sea and air vehicles, players will soon witness the best-in-class online warfare experience. Whether online or in the single player campaign, players use every weapon and vehicle to survive and conquer. Players choose from 15 authentically modeled vehicles, each providing a tactical advantage and offering a variety of gameplay options. The new UH-60 transport helicopter can ship an entire four-player squad directly into battle, while allowing two additional team members to wreak havoc with its two mounted rail guns on board. Battlefield: Bad Company 2 players will have a selection of 46 weapons that they can customize into over 200 different, high-powered firearms. There are over 15,000 kit variations possible in the game, giving each squad member the ability to choose the weapon upgrades and combat enhancements that best fits their playing style. Between the weapons, kit combinations and deadly vehicles, players will be equipped with a wide range of gadgets, accessories and character specializations to give them the edge in the heat of battle. The DICE signature Frostbite™ engine delivers Destruction 2.0, adding a new layer of strategy to the all-out warfare. New to Battlefield: Bad Company 2 is the micro-destruction mechanic that allows players to be more strategic on the battlefield by chipping cover away bit by bit or taking down an entire building and watching it collapse with enemies inside. I love the first one! And BC2 can only be better. I'm guessing those are PC screens b/c those pics are on par with the pics of uncharted 2, and I find that really damn hard to believe. The first one was really addicting so I have high hopes for this game, but I still say MW2 is gonna be trouble for sales of any other shooter in the same six month window.